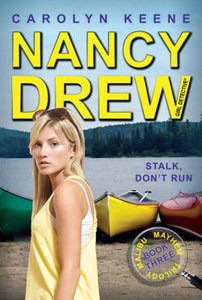 Malibu Mayhem follows Nancy Drew back to River Heights in this conclusion to the latest mystery arc! After an unforgettable vacation on the exclusive beaches of California, Nancy, Bess, and George are glad to be back in down-to-earth River Heights. But just as they’re settling into a boring summer routine, Malibu excitement follows them home: the superstar Casabian Sisters show up, convinced River Heights is the perfect setting for their newest reality show. And where the Casbians go, drama—and now danger— is never far behind. Quiet River Heights and nearby Camp Athena is turned upside down with a terrifying mix of midnight phone calls, missing Casabians, and a menacing nighttime stalker. But this isn’t a reality show, this is real life—and Nancy and her friends need to find out real fast just who is out to destroy their home… and their lives. Ned Nickerson flashed one of his über-cute smiles. He’d been my boyfriend since junior high, but the way he looked at me with his brown eyes still made my heart do a triple flip. When Ned wasn’t dating me or studying English lit at our local university, he was honing his journalist chops at his dad’s paper, the River Heights Bugle. His latest assignment: interviewing me, Bess Marvin, and George Fayne about our latest case on trendy Malachite Beach in Malibu, California. As the four of us sat in Sylvio’s Pizzeria sharing a jumbo mushroom and olive pie I couldn’t think of a better—or yummier—place to do business. “Did we do all that?” George teased. She held her slice up and let the oil drip into her mouth. Bess shot George a disgusted look as she neatly cut her slice with a knife and fork. She and George were as different as pepperoni and anchovies, which made it hard for anyone, including me, to believe they were actually first cousins. “You’d get air online if it were possible, George,” Bess joked. Ned smiled back with a little wink. He was smart and handsome and nice—no wonder so many girls in River Heights had crushes on him. Luckily, the only one I had to worry about was Deirdre Shannon. Deirdre was the daughter of a super-successful attorney, and whatever she wanted, she got. That was okay with me, as long as she didn’t get Ned. Roland. Ugh. The mere mention of the crazy cult leader’s name made my skin crawl. “What about him?” I asked with a frown. “He and his sidekick Inge injected those poor people with a mind-altering drug they thought was vitamins,” Bess said. George said the word “gracious” with a sprinkle of sarcasm. Stacey, a star Hollywood party planner, had lent us her trendy Malachite Beach house for three whole weeks. Little did we know she and Roland had planned something a lot more sinister than a party. “Bess, George, and I discovered that Roland had plastic surgery to totally alter his appearance,” I said. “Now he’s on the run,” Bess said with a sigh. “So, what does he look like?” Ned asked. “According to Dr. Raymond, Roland has a receding hairline, a cleft chin, and a long, angular nose,” I said. “Give me a break,” George said, popping a mushroom into her mouth. Ned studied the three of us. “Maybe I’m wrong, but you don’t seem worried that Roland is somewhere out there,” he said. We took a short break from Ned’s interview as Sylvio brought us some of his famous garlic knots. “I guess we are celebrities in this town,” George said as Sylvio hurried back to the counter. What? Had Ned Nickerson, rising star reporter, just asked me about the Casabian sisters? We finished our pizza and plowed into Sylvio’s complimentary garlic knots. Being with Ned and my friends at our favorite hangout reminded me how happy I was to be back home in River Heights. Sure, Malachite Beach was exclusive and beautiful—especially before the oil spill. But the little midwestern city of River Heights would always be home. “You just got back. Already working on a new case?” Ned asked. But working at Safer’s would be anything but boring. Mr. Safer was a Broadway theater fanatic. He was known throughout River Heights for singing show tunes behind the counter—and even making his customers join in on the chorus. After we left Sylvio’s, Ned kissed me good-bye and headed for the Bugle office. As I walked down Main Street with Bess and George, they shared their own plans for the summer—or at least what was left of it. “It is for Bess,” I said with a smile. Bess might be totally girly, with her perfectly blown-out blond hair and cutting-edge outfits, but in a flash she could roll up her sleeves and build or fix anything. George could fix anything too—as long as it was high-tech or electronic. That’s why she would be spending the summer fixing and upgrading computers, MP3 players, even mobile phones. “I thought retro was cool,” I said. Hannah Gruen was much more than a housekeeper. For years she had been just like a mother to me. Sure, I missed my real mom, who died when I was only three—but Hannah was truly part of my family. I was about to pocket my phone when a new text came in. This one wasn’t from Hannah or Ned. In fact, I couldn’t identify the sender by its number or name. “Isn’t 1717 the old house with the peeling paint that’s been empty for more than a year?” George asked. “Didn’t someone die in it?” Bess asked uneasily. I stared at my phone, more intrigued than worried. Who was this Shanager? Why did he or she want us to go to the house? “I want to check it out,” I said. Bess needed a little more convincing, but after I suggested that it might be a “Welcome Back to River Heights” surprise party, she caved. The three of us set out for Water Street, finding the house at the end of the block. Instead of looking broken-down and abandoned, it had a fresh coat of paint, new windows, and a neatly mowed lawn. “Which makes it even weirder,” Bess said. “What does this one say?” Bess asked. “‘See you in the back,’” I read out loud. This time I quickly texted back, WHY? “With a chain saw,” Bess said. The three of us rounded the house to the backyard. No one was there. Almost immediately my phone went off with another text. “We’re being watched,” Bess said quietly. The sensible, mature part of me said, Don’t even think about it. The curious detective part told me, Go for it. Before my friends could talk me out of it, I grabbed the handle on the door and pulled it open. Looking down into the cellar, I saw only darkness. I’d taken one step when I felt a bony hand grab my ankle.